I’ve lived in Las Vegas for sixteen years. This might not seem like a very long time, but in the city that reinvents itself at least once a decade, it’s plenty long enough to develop a case of nostalgia. I can’t drive by the “Fabulous Las Vegas” sign without recalling the old Klondike Casino that used to be across the street to the east. I still think about the old Boardwalk every time I go to City Center. Brand new beds & snakeskin headboards add comfort & ambiance to the newly renovated rooms. 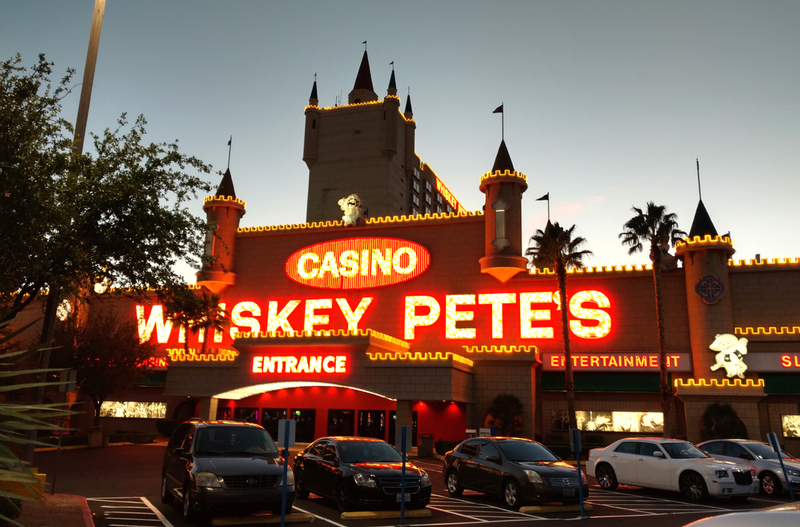 I thought about both of those places last night, when I drove down to Primm for the great reveal of a $3.5 million renovation at Whiskey Pete’s. The name of this place alone is enough to arouse nostalgia. Resorts on the Strip all have names honoring or evoking world class luxury, but Whiskey Pete’s is named after an old bootlegger who was buried standing up with a bottle of moonshine in his hand. 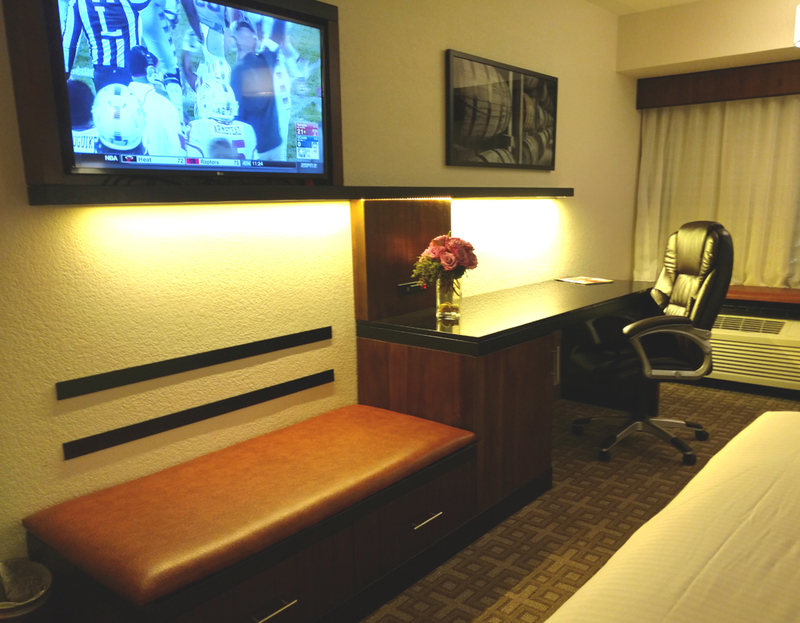 Every room has a nice desk, comfortable work chair, flat screen TV, and refrigerator. The remodeled rooms have new carpet, new wallpaper, new furnishings including recliners and refrigerators, new light fixtures, and new bathrooms. What’s especially nice is that design details honor the resort’s history and personality. There are artsy photographs of whiskey barrels on the walls, rustic wood detailing on the furniture, and headboards upholstered in faux rattlesnake. I think Whiskey Pete would have approved of the moonshine toast we raised to his resort last night at the kickoff party, and he’d be proud of the luxurious new rooms now available to guests. I for one am anxious to try them out. 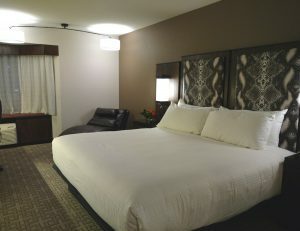 It’s a delightful way to step back to the Nevada of yesteryear without having to sleep in a forty-year-old bed. The hotel threw a very nice opening party for friends and supporters of the hotel with a live band, open bar and a nice dinner. Very festive. We at Las Vegas hospitality Supply are very excited to see the great response received on Whiskey Pete’s. Being responsible for the design through the manufacturing of all furniture and interior products including items like the custom manufactured snakeskin and on to the demo, construction and installation for this full scope project, it means a lot to us to see the many positive responses received. To Affinity Gaming, we thank you for this great opportunity!